There are places that give us a hit every time we look at them, moments when everything combines to make ordinary views extraordinary and artists who are able to take a view of a place, whether real or imagined, and communicate through it something that we recognise but could not express. They have found a way to distill the frisson into their work, and while the viewer may be enjoying the paint surface and colour, they also feel a sense of wonder at the world in which we live. One of Sladers Yard’s most popular painters, the well established artist Julian Bailey is not afraid to try new ways of painting and different media. His large oil paintings and smaller drawings in conté and pastel have sold all over the world and been exhibited successfully in numerous solo shows in Cork Street and at Sladers Yard. Putting them aside for some months he became thoroughly immersed in painting tiny almost abstract gouache paintings of place and countryside in glowing colours. In this exhibition we are delighted to introduce these new works. Born in 1963, Julian Bailey had his first successful exhibition at Malvern Public Library when he was still at school. He studied art at the Ruskin School while attending New College, Oxford and then went on to the Royal Academy Schools where he was awarded the Turner Gold Medal and later the Landseer Scholarship. He had his first one-man show in London in 1991 and has exhibited regularly since, joining Browse & Darby in Cork Street in 1999 as their youngest artist. He and his family moved to Dorset in 1998 when Julian began to paint landscapes, particularly the Dorset coast. In 2011 he was elected to the New English Art Club who awarded him the David Messum Prize. His work is in many eminent collections throughout the UK. Daisy Cook’s abstracted landscapes take one down paths of feeling. Her very special sense of colour combines neutrals and texture to set bold unusual colours alight. The geometry and abstract pattern in her paintings challenge and articulate the description of nature. She works in layers, abrading and working back the surfaces to reveal or partly reveal what is behind, giving a remarkable sense of depth and of time. Subtle and at the same time strong in their lines and character, her paintings dwell in the mind, calm and potent. Daisy Cook and her sister Lucy were Peter Cook’s only children from his first marriage to Wendy Snowden. It was his death in 1995 when he was only 57 which motivated Daisy to become a full-time artist. After school Daisy enrolled at art college in Hastings, but didn’t complete the course. She trained and later worked as an haute cuisine chef, before moving to London and teaching to support her first ‘tentative exploration’ into painting. When she showed pictures of her work to an art dealer she met at a wedding, she was offered a show immediately. It was virtually a sell-out and since then she has painted professionally and shown regularly in London at the Northcote Gallery. 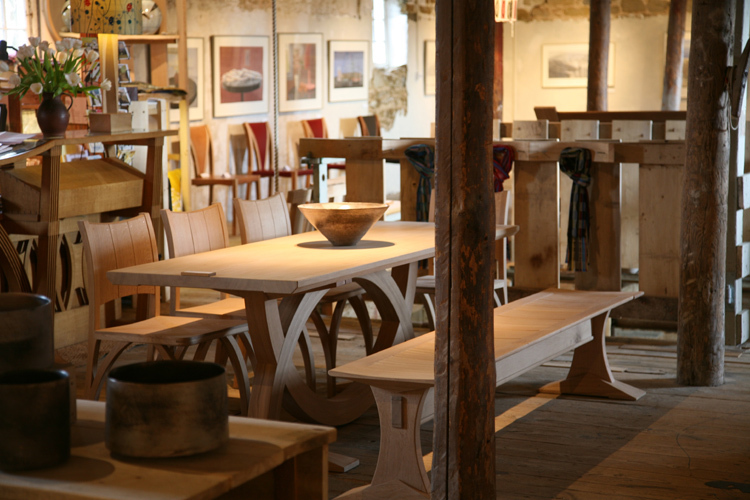 Her work is in a number of corporate collections as well as those of celebrities including Geraldine James, Rory Bremner and Terence Conran. This is her first show at Sladers Yard. Luke Elwes paints water, the surface reflections, shadows and the colours underneath. 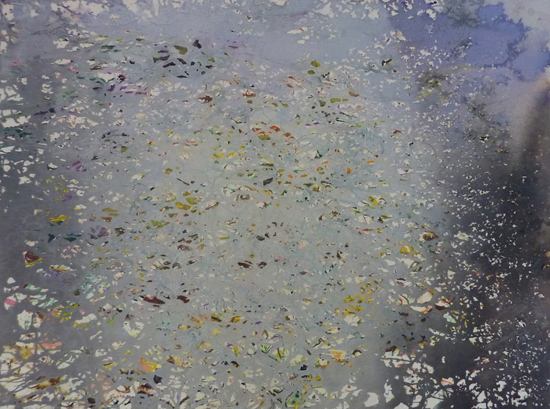 His recent works on paper are made by allowing the water to run across his work lifting and dissolving the colours and marks in flowing patterns across his paintings. Luke Elwes was born in 1961 in London, where he now lives and works. His early years were spent in Iran, where the light and space of the desert were a formative influence. Between 1980 and 1985 he studied History at Bristol University and Painting at Camberwell School of Art (UAL), and in 2007 was awarded an MA distinction in Art History from Birkbeck College, London University. While working at Christies he began to travel and write, and has continued to travel extensively, discovering and revisiting remote locations in India, Asia Minor and North Africa. In 2013 he was awarded a grant to study at the Vermont Studio Center and in 2015 will be artist in residence at the Albers Foundation, Connecticut. Since 1990 his work has been shown in private galleries in London including the Adam Gallery, Broadbent, Art First and Browse & Darby, at Art First (New York), and in Paris, Milan & Bergamo, and in public galleries including Royal Academy, Christies, Barbican Gallery, Estorick Collection London, Kettles Yard Cambridge, Southampton Art Gallery, and Bury Art Gallery Manchester. He also writes about contemporary art for journals including Modern Painters, Royal Academy Magazine, Galleries Magazine and Abstract Critical.com. In 2011 he was invited to give an ‘Artist’s Eye’ talk at the National Gallery. 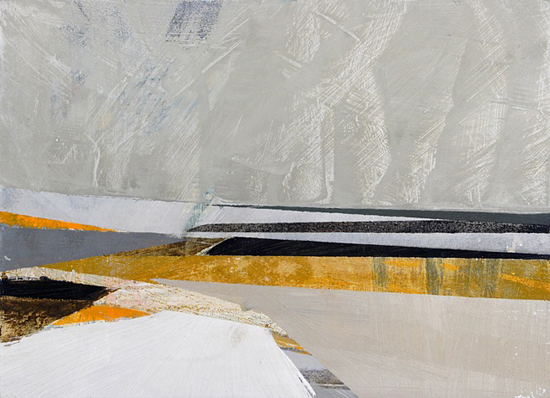 Alex Lowery’s paintings of West Bay, Portland and Seaton catch the essence of place. His way of looking at these places catches something both specific and universal. Often he contrasts fairly recent man-made structures with the timeless natural landscape of hill, sea and infinite skies. His recent work has more detail and a warm confidence that brings in glowing colours in unusual combinations. The abstract qualities of his paintings are always very strong both in line and tone and these new works are particularly striking. Born 1957 in London, Alex Lowery studied at Bath Academy, Sir John Cass School of Art and the Central School of Art, graduating in 1982. He has painted and shown regularly in Dorset and London since 1994. He shows in London with Art First and has shown at Browse & Darby, the Estorick Collection as well as in many other galleries in Europe and nationally. He lives and works in Charmouth with the artists Vanessa Gardiner and their daughter Jessie. Alex Lowery has had three solo shows at Sladers Yard where he has a strong following of those who relish his restrained uplifting paintings of this exceptional coastline. 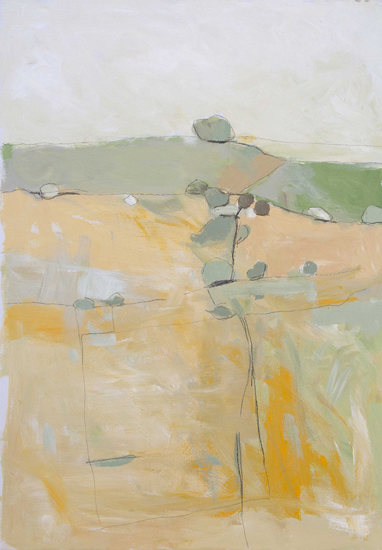 David O’Connor’s paintings combine multiple points of view, memory and history to find pattern and abstraction within the soft colours of the Wessex landscape. His sculptures and drawings revolve around boats inspired by Iron Age boat sculptures, myth, poetry, astronomy and cartography. O’Connor describes his paintings as ‘direct and intuitive, his use of colour is fresh and original and his mark-making holds great appeal. He is also fascinated by mapmaking and the dichotomy between the changing and the timeless nature of landscape. ‘In landscapes particularly places like Wiltshire I feel a strong sense of history, walking the same soil and looking at the same sun and moon as the people who built Stonehenge. The paintings are an attempt tocombine topographical information with an awareness of pattern and abstraction within Wessex landscapes. Fragments of memories of place and layered points of view are combined in single images.’ Many collections have bought his work including Unilever, numerous hospital collections, Marlborough College, Allied International Ltd, Roundstone International, Delaney Fletcher Delaney, Jacob Blacker Architects, Handmade Maps and Lady Gibberd. ‘Aesthetic and intellectual gratification go hand in hand, and indeed this has become one of the hallmarks of David O’Connor’s art.’ Jonathan Benington, Victoria Art Gallery, Bath. 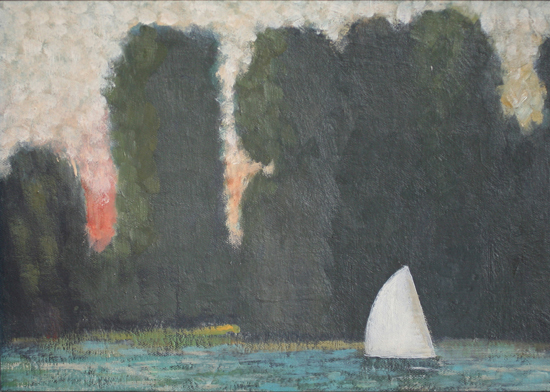 Alfred Stockham RWA ARCA’s intensely poetic compositions exude quietude. Painted against the odds of his now severe physical impairment with Parkinsons disease, which necessitates long contemplation between brushstrokes, his paintings take us out of ourselves to a place beyond. Alfred Stockham has had a distinguished career. Born in London, he loved painting from his earliest years but he followed the family tradition and spent seven years in the Royal Navy before studying for three years at Camberwell School of Art followed by three more at the Royal College of Art where he was awarded a Silver Medal. He was a Rome Scholar and Grenada Arts Fellow at the University of York before he arrived in Bristol in 1968 to takeup a post as lecturer at Bristol Polytechnic (now the University of the West of England) where he became Head of Fine Art. He left to devote himself to painting full-time. Alfred was elected a full member of the Royal West of England Academy in 1993 and was appointed Honorary Curator of the permanent collection of the RWA in 2001. His work is in public collections throughout Britain and Ireland. Alfred’s work seems instinctive yet it is backed by a strong intellect and knowledge of art history. Economical with words yet with a great sense of humour, Alfred’s work speaks for itself.